This frameless shower door looks great in any bathroom. Comes in a brushed nickel finish, which is both classy and modern. This DreamLine shower door is a great addition to your next bathroom renovation. The DreamLine Enigma is a fully frameless sliding shower door or enclosure is stunning with 1/2 in. thick tempered glass and a modern design that delivers elegance and sophistication. The striking stainless steel hardware adds distinguished style and quality to complete the look of luxury in an upscale design. Glass is treated with DreamLine exclusive ClearMax water and stain resistant glass coating for superior protection and easy maintenance. IMPORTANT! All measurements should be taken only AFTER walls are finished (tile, back walls, etc.). Model is reversible for a right or left door opening installation; Configuration consists of Stationary Panel and Sliding Door. Please note: 2 person team necessary for proper installation. Drilling into the threshold is required for installation of this product. 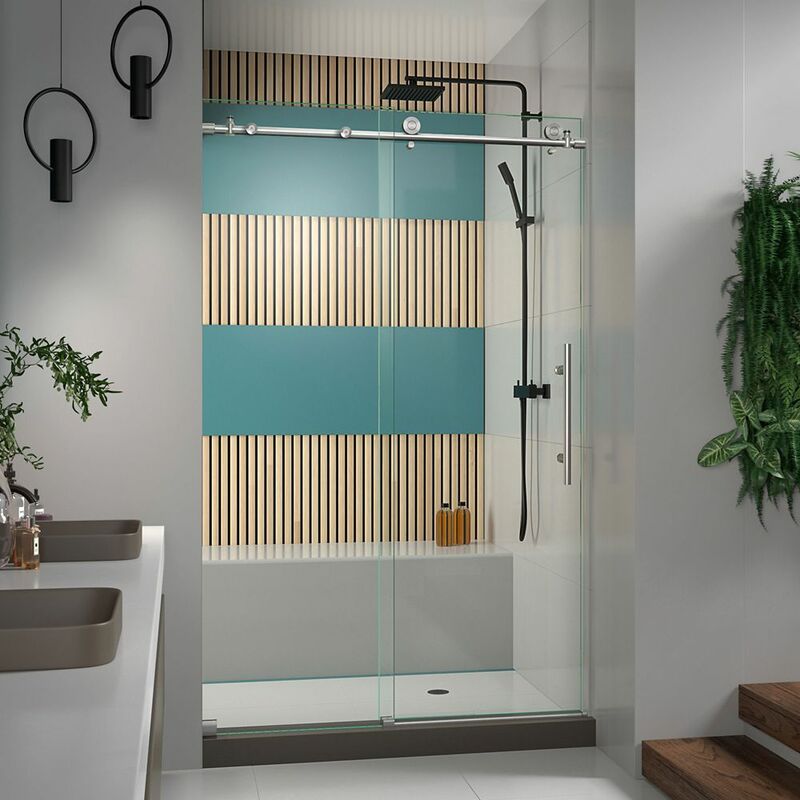 Enigma-X 44-inch to 48-inch x 76-inch Frameless Sliding Shower Door in Brushed Stainless Steel The DreamLine Enigma-X shower door, tub door or enclosure brings an air of sophistication and luxury with its modern and fully frameless design. The striking stainless steel hardware delivers a perfect mix of exceptional quality and cool urban style. DreamLine exclusive ClearMax water and stain resistant glass coating adds superior protection from stains and is nearly maintenance-free. Model is reversible for a right or left door opening installation. Please note: 2 person team necessary for proper installation. Drilling into the tub/threshold is required for installation of this product. Enigma-X 44-inch to 48-inch x 76-inch Frameless Sliding Shower Door in Brushed Stainless Steel is rated 4.7 out of 5 by 169. Rated 5 out of 5 by HomeDepotCustomer from Contractor installed the door. It’s smooth when opened except... Contractor installed the door. It’s smooth when opened except for it catches and releases the top edge of the plastic edge on the stationary glass. Rated 1 out of 5 by Drew from It was the wrong color finish, so I returned it.... It was the wrong color finish, so I returned it. Rated 5 out of 5 by HomeDepotCustomer from Love the looks and it works well.... Love the looks and it works well. Rated 5 out of 5 by Tony from Excellent quality. Somewhat cumbersome to install for first time installing... Excellent quality. Somewhat cumbersome to install for first time installing this type of door. Looking forward to years of trouble free usage. Rated 5 out of 5 by Dean from Excellent shower door and highly recommended! I am glad... Excellent shower door and highly recommended! I am glad that I utilized the contractors provided by Home Depot to install the shower door! Rated 5 out of 5 by Gregg from Love This Door Had a bathroom completely remodeled including the removal of a tub a shower installed. This frameless door is beautiful, heavy and rolls easily. Just understand there is no adjustment on this model for an out of plumb wall as the manufacturer has stated. Also, DO NOT attempt to install this door on your own. Call a professional installer. In the end you'll be happy you did! I highly recommend Dreamline shower doors.